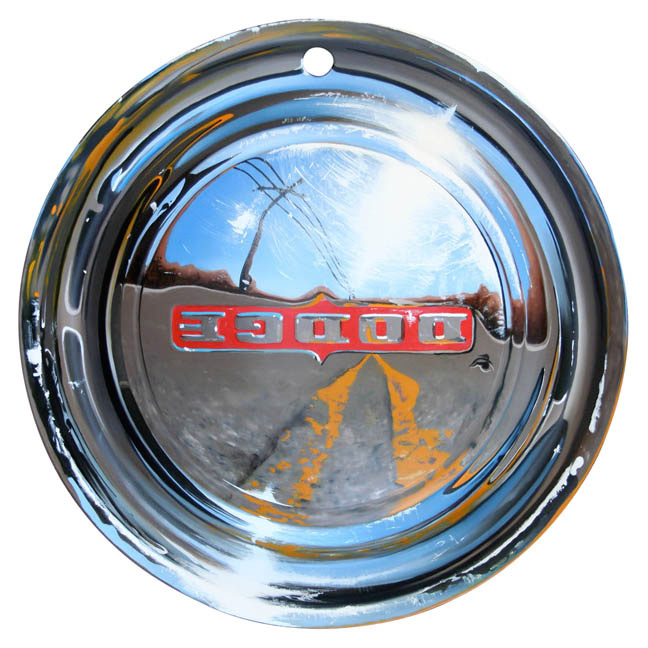 California and Backoil and acrylic on Dodge hubcap (This is paint on an actual hubcap. There are no actual shining reflections, scratches or camera glares; it is completely covered in paint and finished with a flat varnish)15" x 15"
Landfill Art Project is an international effort encompassing 1,041 artists to claim a piece of rusted metal garbage and create fine art. I chose to paint my hubcap to emulate chrome (of course) simply to "reflect" inspiration of the landscape from a roadtrip to California and back. Although the project is in its infancy ,the project's founder, Ken Marquis hopes to have it completed by 2012. It will evolve from a simple idea of taking forty-one old rusted hub caps and creating forty-one pieces of great art. The second phase has already started with the acquisition of one thousand additional (1000) rusted hub caps which will be turned into cleaned and primed "metal canvases". The project will continue with finding one thousand (1000) talented artists who believe in this project. The third phase will involve publishing a book on the project showcasing all one thousand forty one (1,041) completed "metal canvases". The fourth and final phase will involve choosing 200 metal canvases that adequately represent the project and create a traveling show. The book and traveling show will publically portray the global art community's effort to positively impact the environment through repurposing previous metal waste into great landfill art.